This convenient kit combines the highly-efficient cutting action of Gerber's Sport Saw with the nip-it-in-the bud precision of our Ratcheting Pruner...all in a handy ballistic nylon sheath. The Sport Saws bone blade cuts with 1/3 less effort than other saws, and it retracts completely into the handle. When open, it locks securely and safely. 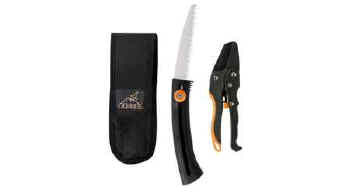 The Pruners blades are coated with a special non-stick coating, while the handle is as durable as it is comfortable.